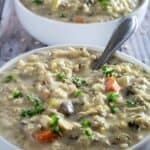 Slow Cooker Creamy Chicken & Wild Rice Soup takes chicken, vegetables, and wild rice and combines them with a mix of herbs and spices. Then it’s topped off with half & half to add the perfect creamy texture. It’s comfort food that’s hot and ready when you’re done with your long day. 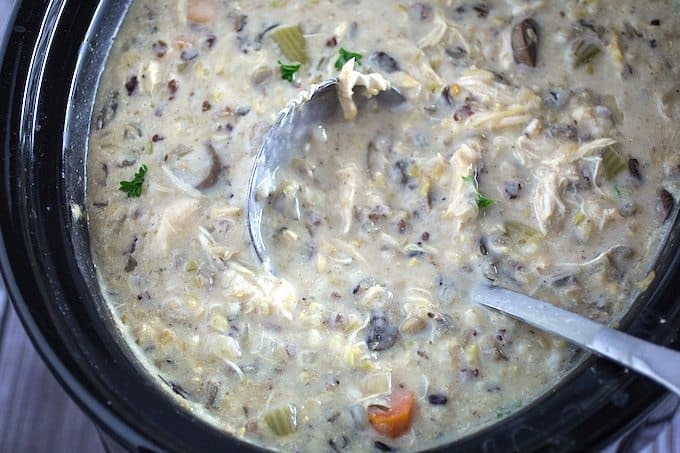 Every so often I like to get on the classic comfort food bandwagon, and Slow Cooker Creamy Chicken & Wild Rice Soup definitely falls into that category. 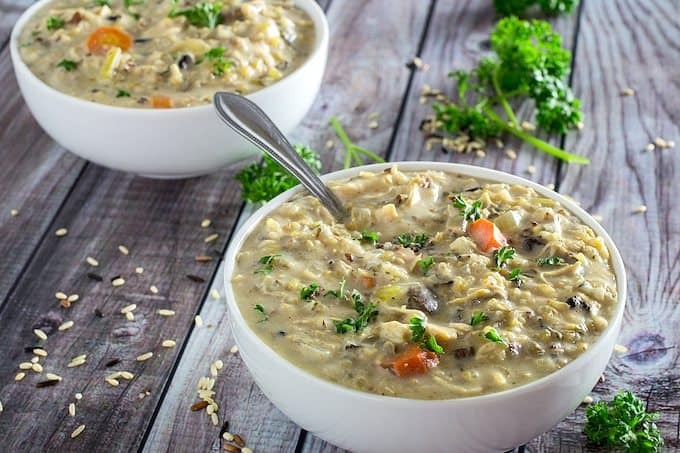 Picture a spoonful of savory creamy hot soup, with the aroma of herbs and spices filling your home, and big pieces of carrots, celery, and chicken to fill you up. Hungry yet? I know I am! It’s February, which means it’s still cold out. Well, maybe not here in Florida, but I know most of the country is dealing with snow and ice right now. I know this because my job keeps making me travel to these places, with a big winter coat and a smile. So, I get it! And every time I get home from my quick trips north, I like to defrost under a palm tree with a big bowl of something warm to eat. 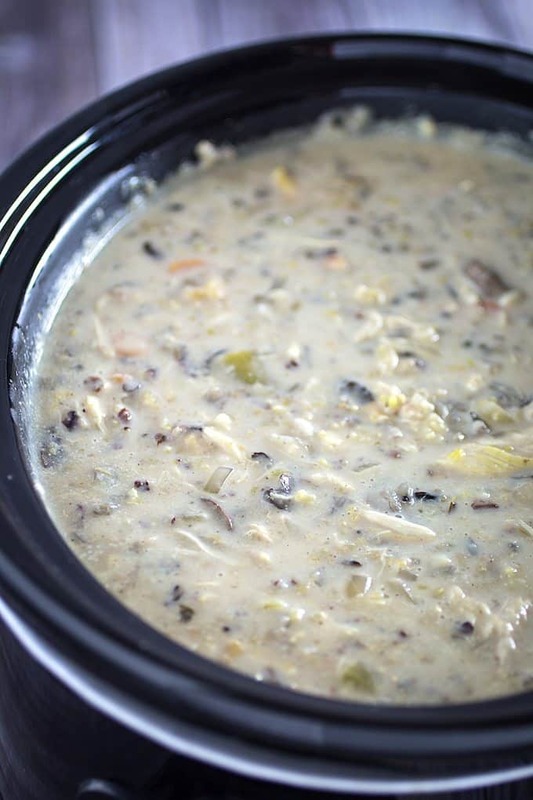 And to me, that says soup, like this slow cooker creamy chicken & wild rice soup. I made this in a 7-quart slow cooker, and it almost filled the dish after the cream was added. So if your slow cooker is smaller, you’ll need to scale this recipe down to fit your dish. Personally, I really like making a 7-quart slow cooker’s worth of food, and freezing half of it for dinner another night. If you like chicken soup, let me take you back a bit in this blog. Waaaaaay back, to when I didn’t really know much about food photography (pardon the photos!). But I did know a thing or two about cooking, and this is one recipe my family has been making for years. It’s my dad’s Slow Cooker Chicken Soup. Because can you really have too many chicken soup recipes? I don’t think so! 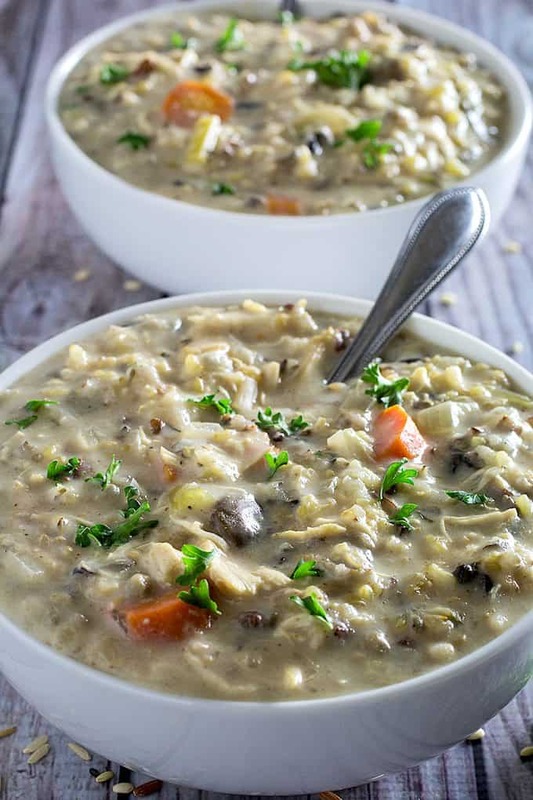 If you like Slow Cooker Creamy Chicken & Wild Rice Soup, you’ll also love these! Potato Leek Soup – This one is perfect for a quick dinner, because it only takes about 30 minutes to make. But if you have longer, I highly recommend getting some gluten free bread baking in the oven and serving it alongside this soup! Cheesy Cauliflower Soup in 30 Minutes – This is pretty similar to the potato leek, but it’s lower carb because of the cauliflower replacing a lot of the potato. Win! Slow Cooker Chicken Enchilada Soup – It’s chicken, it’s spicy, it’s cheesy. Need I say more? 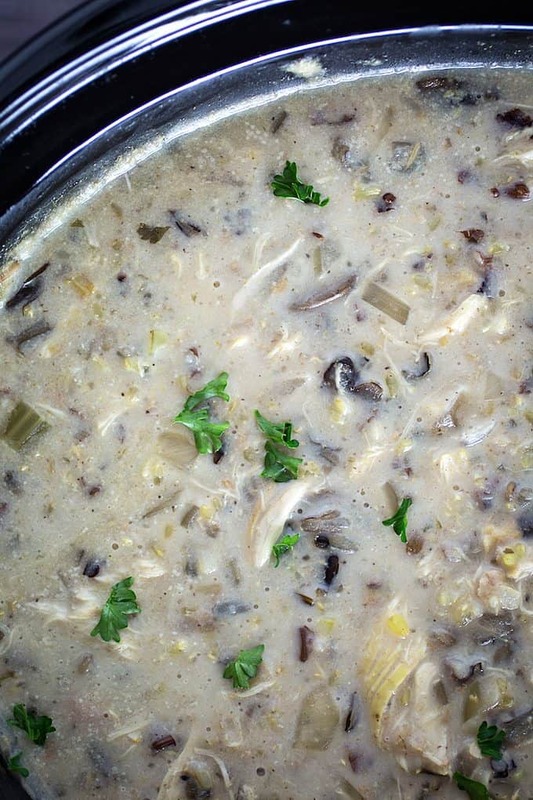 Do you have a favorite soup that you make every wintertime? I’d love to hear about it! 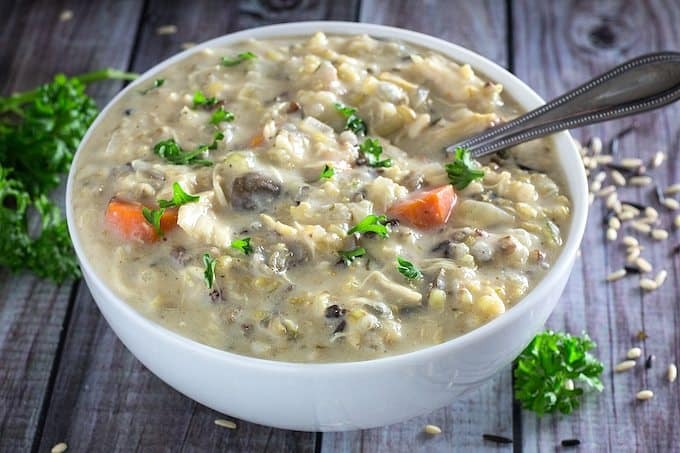 And for now, I’m going to snuggle down and defrost with some slow cooker creamy chicken & wild rice soup, and the sweet sound of a Florida thunderstorm outside my window. Place all ingredients (except for half and half) in crock pot. Cook on HIGH for 4 hours or LOW for 8 hours, or until chicken is cooked through. When time is up, remove chicken breast and use two forks to shred chicken. Return to crock pot. Stir in half and half until well combined. Let cook an additional 20-30 minutes. Stir before serving.